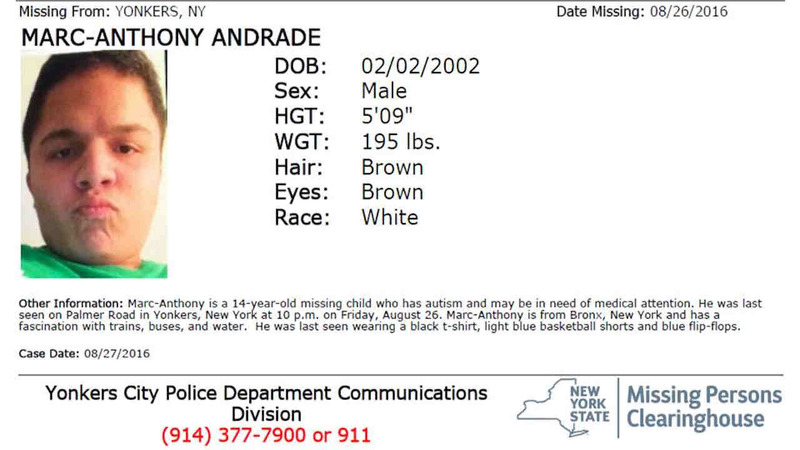 Marc-Anthony Andrade, a 14-year-old with autism, has been reported missing from the Bronx. YONKERS, New York (WABC) -- An alert for a missing 14-year-old with autism was canceled Saturday afternoon. Bronx teen Marc-Anthony Andrade was last seen at 10 p.m. Friday on Palmer Road in Yonkers. No further details were given. A missing alert was issued Saturday morning. He was thought to be possibly in need of medical attention and has a fascination with trains, buses and water.